One of my younger sisters visited me this month. She came with her husband and left her four kids with my mom. 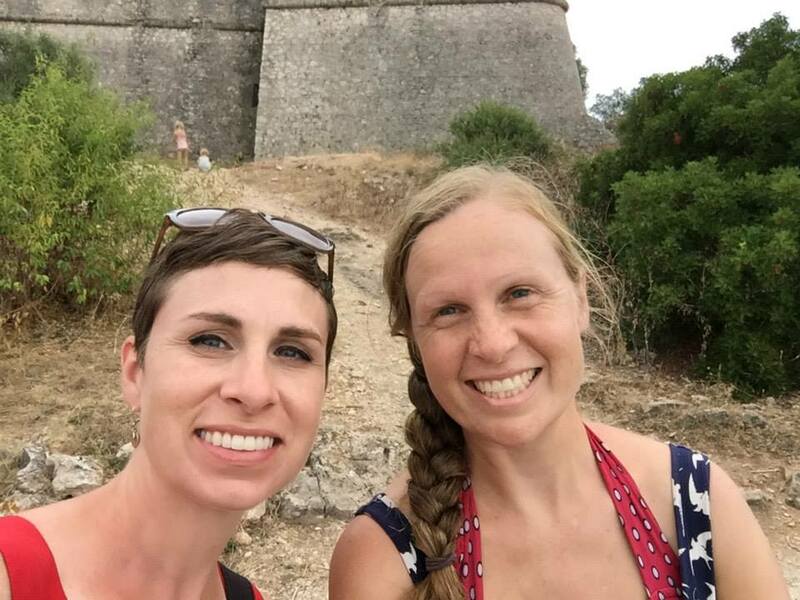 The two of them visited just about every museum in Nice, walked miles and miles every day, ate lots of ice cream and pastries, and enjoyed going at an adult's pace. They took a trip to visit some friends in Germany, spent a day in Paris, watched a stage of the Tour de France, and even biked up and down Mont Ventoux. Well, her husband did! 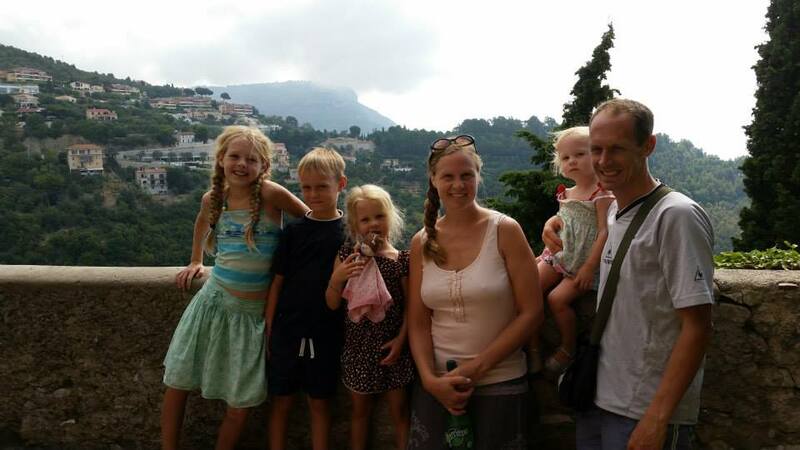 We joined my sister on a few outings, including a visit to Eze, Cap Ferrat, and Fort Alban. 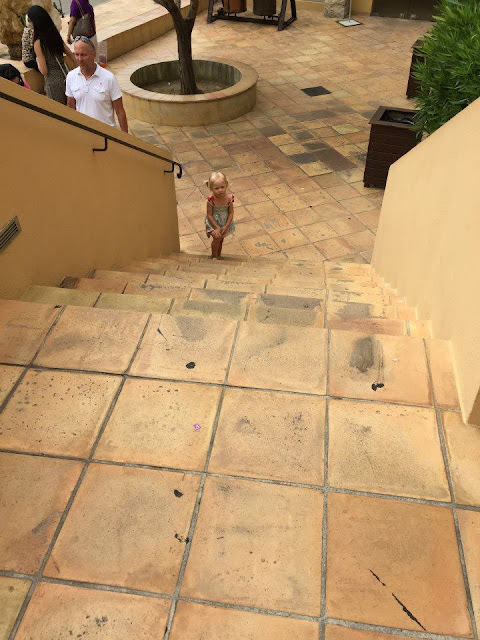 Ivy didn't want to walk up the stairs. We played a game of chicken to see who would capitulate first. She won. I packed two suitcases today, put a few bags & boxes in the attic, and have bags labeled "stay in France" scattered around the house. We've been in a heat wave since the beginning of July with no cool weather in sight. Compared to summers in the midwest US, it's lovely here: sunny, around 30/31 C (high 80s F) during the day and only cooling off slightly at night to 25-27 C (high 70s F). But air conditioning is still rare in French homes, meaning that it's as hot indoors as out. I open all the windows at night, place fans strategically, and close up in the morning. But between the unremitting sun, the warm nights, and being on the 4th floor, we are TOO HOT! We usually go swimming late in the afternoon when the heat inside is just too uncomfortable. We cool off in the almost-too-warm water and head home a few hours later for a late dinner. We don't go out much in the morning unless it's a place with shade. Sometimes we improvise, like this morning when we played in a nearby water spigot and then raced cars down a little drainage ditch on the rue Rosetti. Zari was sitting on the ground taking pictures. "Mama, you're a giant!" Here's a little movie we made at the Miroir D'eau in Nice. Enjoy! Old Nice is a triangle hemmed in by the sea, the Paillon River, and an enormous plateau housing a ruined medieval fortress. The Paillon was slowly covered over to make space for parks and gardens and, later on, roads and traffic circles and parking garages and bus depots. The river still flows underground. Over the past 15 years, the city of Nice has transformed the area above the underground river. It moved several traffic arteries into underground tunnels, transformed other roadways into tram lines, created huge pedestrian squares such as the Place Masséna, and removed the hideous bus depot and parking garage. Now the Promenade du Paillon is the jewel of the city, with parks, playgrounds, gardens, and outdoor theaters. One of our favorite places in the Promenade du Paillon is the miroir d'eau ("mirror of water"), a huge zero-depth fountain with hundreds of jets of water. In other words, a gigantic splash pad!